Archos is one of the more prolific tablet makers and they just announced a new tablet made specifically for kids called the Archos Arnova ChildPad. Unlike some of the overpriced children’s tablets of the past, the Archos ChildPad’s retail price is $129 on Amazon, which given the specs is about on par with similar tablets. 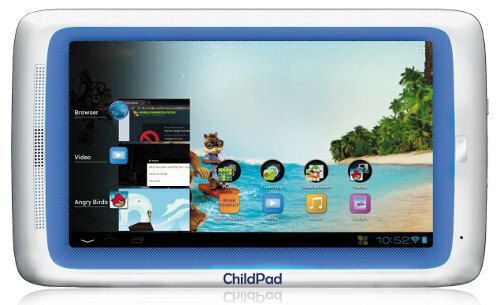 The ChildPad runs Android 4.0 and is powered by a 1GHz Cortex A8 processor with 1GB of RAM and 4GB of storage space, with a microSD card slot for additional storage. It has a 7-inch screen with the typical 800 x 480 resolution. But here’s the kicker: it has a resistive touchscreen instead of capacitive. That’s the main drawback when comparing this tablet to similar Android 4.0 tablets. Perhaps they went with a resistive screen because it is more durable for kids instead of the glass capacitive screens? Other features included WiFi, a front camera, built-in speaker, microphone, and accelerometer. It also ties-in with Alvin & The Chipmunks 3 for exclusive content and comes with a bunch of games pre-installed. Aside from the external design and construction, the main thing that makes the ChildPad a tablet for children is the fact it comes with software called Mobile Parental Filter that blocks inappropriate web content. This isn’t a permanent feature, however. It’s free for six months, then you have to pay an annual subscription of $9.99. It’s good to see tablet makers coming out with tablets specifically for young kids, but when it comes right down to it, you’d probably be better off getting a better tablet with a nicer screen for about the same price or cheaper and then install the Mobile Parental Filter software yourself.